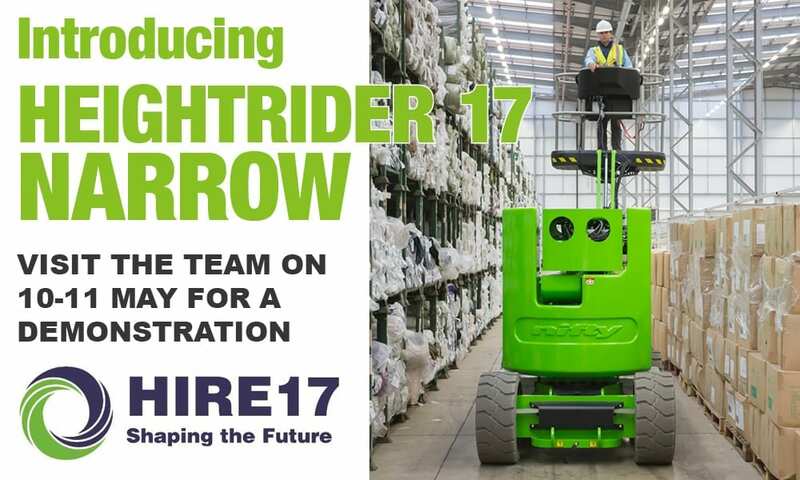 Nifty Australia will be introducing the Height Rider 17 Narrow at HIRE17. HIRE17, The HRIA annual conference, runs from 10-11 May at Rosehill Gardens in Sydney. Please visit our stand for a demonstration of this versatile and efficient machine. HIRE17 presents a unique opportunity for all those involved in the hire and rental industry to learn from international speakers, network with industry colleagues and gain tangible insights that will positively impact their business. The new Height Rider 17 Narrow (HR17N) will lift 2 men and their tools to a working height of 17m or a working outreach of 9.7m. Its useful 180° rotating cage and fly-boom coupled with fully proportional multi-function controls deliver exceptional precision when positioning, making tasks easier and quicker to complete. An impressive working outreach with zero tail-swing helps the HR17N to reach awkward jobs, even when space is limited, and its super-efficient power system allows the batteries to work for longer, so more work can be completed and running costs reduced. The HR17N is available with two power options. You can chose from a super-efficient battery-only power system, or Niftylift’s revolutionary Hybrid power system, delivering the ultimate combination of environmentally conscious efficiency and performance. For more information regarding the HR17N or any other self propelled boom lift, including the HR12N and HR15N, please contact us. 1.5m Narrow Chassis. Allowing operation in confined areas. 180° Platform Rotation with Fly-Boom. Improving operator access. ToughCage with SiOPS® as Standard. Multi-award winning operator protection. Proportional Multi-Function Control. Fast & precise operation. Efficient Power System. Maximising battery output to do more with each charge. Hybrid Power Option. Versatile, fuel efficient & environmentally conscious.